How to start a PURPOSE movement. 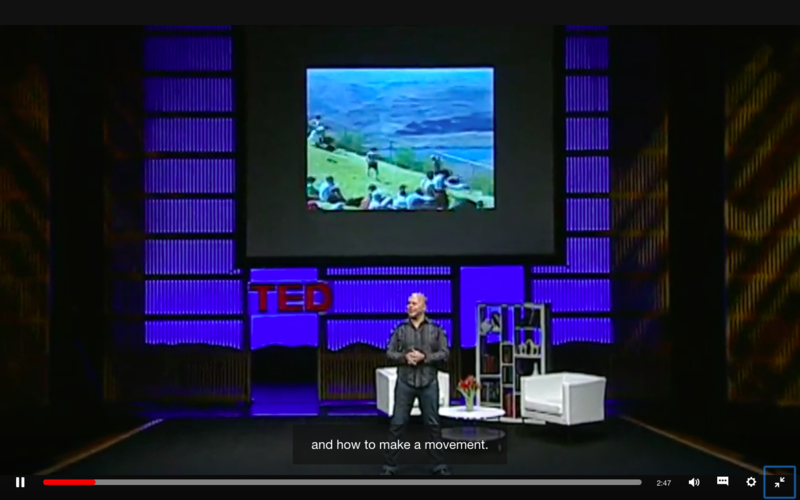 I just love Derek Sivers 3-minute TED talk, ‘How to Start a Movement’. Don’t you? It’s a lesson on leadership, not just for our appointed C-suite leaders but anyone willing to take radical responsibility to become a self-leader at work. According to Sivers, leadership is over-glorified and while it takes one lone nut to start a movement, it’s the first followers when embraced as equals by the leaders, that will give the movement momentum. If you’re passionate about bringing meaning to life in your workplace, my first recommendation is to think of it as a ‘purpose movement’ rather than a ‘purpose program’. A ‘program’ feels highly structured and process-driven like it’s ‘done’ to people instead of something they’ll willingly sign up to. On the other hand, a movement requires no hierarchy. It can’t be mandated and no one is coerced to join. People opt-in because they’re intrinsically motivated. Movements evolve organically through word-of-mouth and observation. They become a case of “I want what she’s having”. Movements become legendary (think Martin Luther King & The Women’s March) and they’re written about in history books. A ‘purpose movement’ requires no permission to be granted. It can be started by anyone, no matter your title, position, influence or standing. It does however, require you to take a risk and be prepared to be the lone nut, at least until your first followers join you. What’s the current state of reality when it comes to purpose vs profit in your company? Why is your company doing what they’re doing (beyond making money)? How is your company allowing you (or not) to bring your own why to work? What change do you want to make? What do you stand for (and against)? Who do you want to join and why would they want to join? What really matters to them? How might you educate and engage these people? What conversations and stories do you want to share and what’s the best way to share them? What do you want them to think, feel and do for the movement? What’s the call-to-action? How can you be a wicked role model of purpose? How do you start this movement by showing and doing instead of telling? Remember, anyone can start a movement. You don’t need to wait for your appointed leaders to make it happen. You just need to be willing to take a risk to get it started. And best of all, you can start right where you are now, no matter where you work.